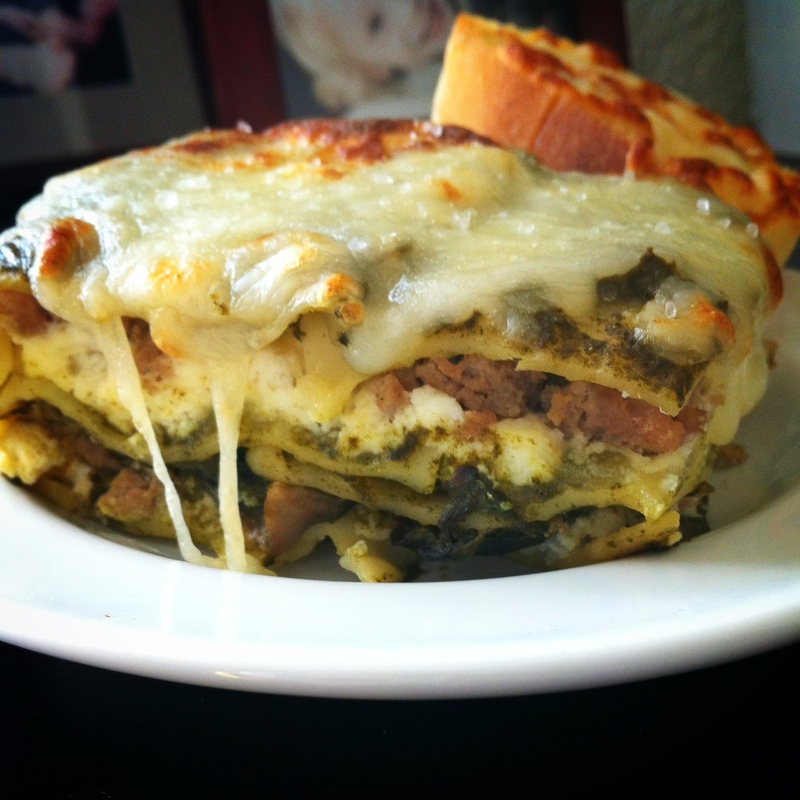 summer spinach apple lasagna | omfg. so good. (and anything else that falls in his path.) He’s Charley the Chonker Baby. This kid loves to eat. 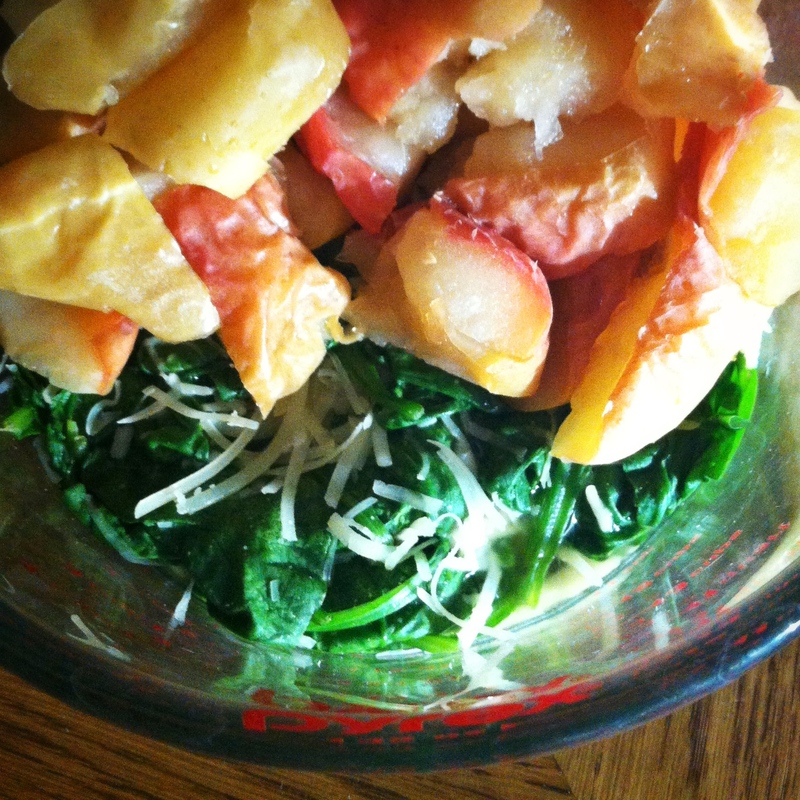 So it didn’t surprise me when he gladly accepted spoonfuls of spinach, roasted apple and parmesan pureé. And since I tend to lick my fingers (and occasionally the spoon) while feeding him, it also didn’t surprise me when the idea for using it as a sauce for a summertime lasagna was born. Preheat the oven to 350 degrees. Halve and core the apples, but do not peel. Place skin side up on a sheet pan and roast in the preheated oven for 20 – 25 minutes or until fork easily pierces skin. Remove from heat and allow to cool to room temperature. Steam the spinach in a steamer basket over 2 – 3″ simmering water (don’t let spinach touch water.) 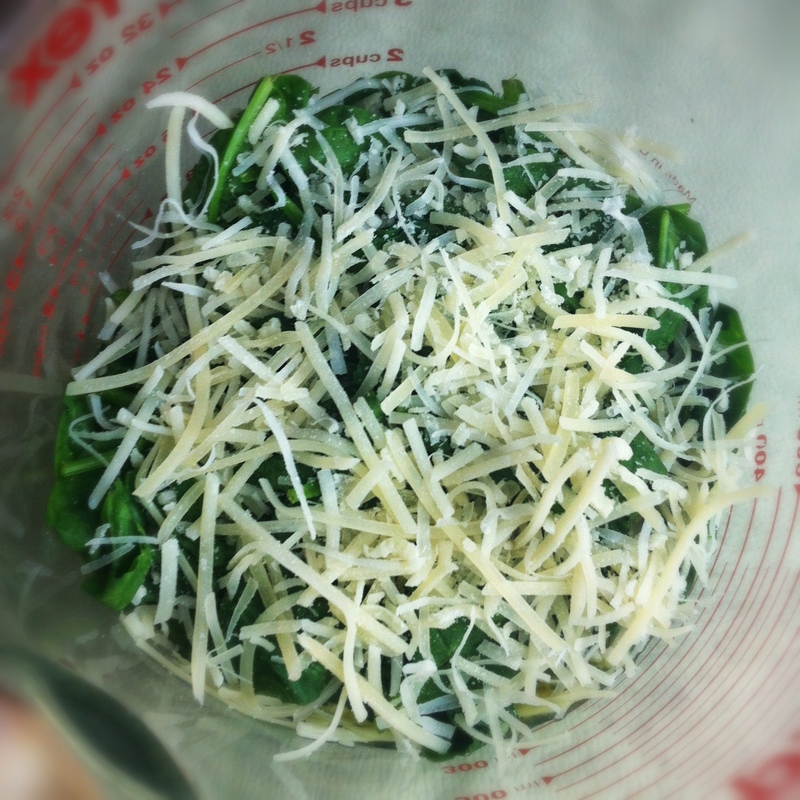 Transfer to a bowl to cool and add the parmesan cheese. Cut the apples into chunks and add to the spinach parm mixture. Transfer everything to the blender and puree to desired consistency. This recipe makes enough for a few small baby sized servings plus the 2 cups needed for the lasagna recipe. You could also double the recipe and freeze the additional for future kiddo meals if you’re feeling so inclined. Now, I love lasagna. I just don’t make it very often because it is pretty time consuming and when you’re chasing a couple of trouble-makers everything takes twice as long as it should. But I’m glad I put in the effort for this. It’s a much lighter version of a standard lasagna. Perfect for summer and pretty darn tasty. Preheat oven to 375 degrees. Cook lasagna noodles according to directions on box, drain and lay flat on a sheet of wax or parchment paper. In a medium skillet, heat olive oil and add shallots and sliced mushrooms. Cook to softened consistency then add to spinach pureé and stir to combine. Brown the ground turkey with salt to taste in the same skillet, drain and set aside. In a medium sized mixing bowl, combine the ricotta, parmesan, egg, garlic powder, salt, white pepper and nutmeg. 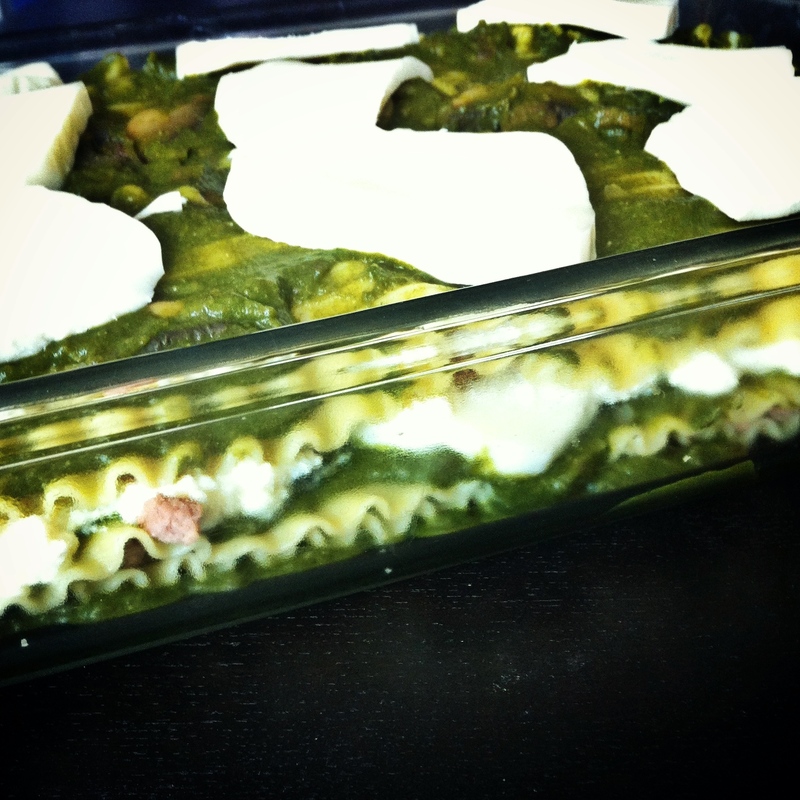 Set up an assembly line with the 9 x 13″ dish, pasta, spinach sauce, ricotta blend, ground turkey and mozzarella. Spread a thin layer of the spinach sauce in the bottom of the pan, then lay down a layer of noodles. Spoon a layer of ricotta blend on top and spread to cover, sprinkle a layer of ground turkey, a layer of spinach sauce, a layer of mozzarella, then start again with a layer of noodles. You should have enough to layer each ingredient twice and end with sauce topped with the remaining mozzarella. Sprinkle with a light shake of coarsely ground sea salt. Cover with foil and bake in the preheated oven for 45 minutes. Remove the foil for the last 15 minutes to brown the cheese. Delicious alternative to a heavy pasta dish. Popeye tested, Charley approved.